Rumor has it that Samsung has worked on a new smartphone, the Samsung Galaxy X, for the past few decades, and that it is a flexible and foldable smartphone. 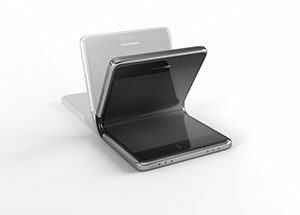 The Samsung Display division recently said that they developed an “unbreakable smartphone panel,” which passed rigorous safety testing so that it can fold and fit in your pocket with ease. The robust display is simultaneously lightweight and tough as glass. The panel’s durable surface has a plastic overlay window attached to it, and the whole display is a flexible organic light-emitting diode (OLED). If Samsung has genuinely found a way to offer these bendable properties in a smartphone, they may have solved a significant technical challenge by removing the need for glass. The flexible OLED screen is likely to have the most basic level of flexibility, meaning that it can bend and curve without distorting the display or breaking, but cannot completely fold in half. Over time, the level of flexibility may increase. For example, in the future, we may see rollable displays that roll up into our pockets like a scroll. In the meantime, we should look out for the new Samsung Galaxy X within the year.